In 2011 a party that was limited for years in the 1% of the Finnish votes, reached the unbelievable 20.1% in the national elections shocking all Europe. In the beginning it was blamed the recession, the euro-crisis, even Greece but soon everybody realized that all these excuses were just the peak of the iceberg. On Sunday 19th 2015, the same party got the 19.1% of the votes and with 38 seats in the 200 seats Finnish parliament is a player in the future of the country that prides to champion in human rights and transparency. Before the elections of 2011, this party published its principals that haven’t changed since then. 1. Finnishness is Finland's gift to the world. 2. Culture funding must be directed in a way that strengthens the Finnish identity. Faux-artsy postmodernists can procure their funding from the open market. 3. YLE's (national broadcast company) Swedish-language programming must be reduced. 5. The child benefits to those on higher income (in excess of €5000) can be reduced. 7. The portion of immigrant students in schools should be capped, in order to prevent separation of schools. 8. More physical education to schools. Behaviour must be graded for younger children than now, and there should be a behaviour grade in the final diploma. 9. Learning Swedish should be optional. 10. Village schools must be kept. 11. Finland to become a critical collaborator with EU instead of a model student. 12. Finland must prepare for the downfall of the EMU and EU in their current forms. 13. Finland must successfully defend against NATO-membership and keep its universal conscription system. 14. Un-work-related immigration must be cut down by reducing the economic appeal of Finland and making it more difficult to bring immigrant families together. 15. Citizenship is a reward - residence is not enough, but language must be learned and one must be able to support oneself. 16. Ghettoization must be prevented with sensible housing policy. 18. Green taxes must be successfully defended against. No to higher energy taxes and congestion charge. 19. VAT must not be raised. 20. Stock dividends must be taxed at a higher rate. 21. Bring back the wealth tax. 22. Finnish work and entrepreneurship to be brought to the fore - economic growth must not be eaten into with domestic policies: adopt the True Finn climate policy. 23. Tougher sentencing for crimes. A foot collar is not the same as doing prison time. 24. Criminal immigrants must be expelled and begging must be criminalized. 25. One may not be punished for defending oneself. They also demand no mention should be made in the Finnish Constitution of the country’s EU membership, the party demands. It says no constitutional protection should be given to EU membership. 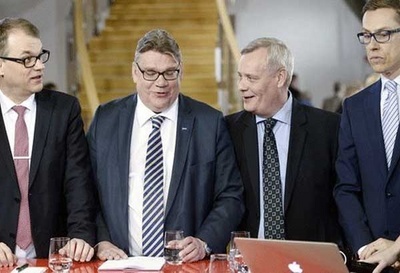 However, the party’s manifesto does not call for Finland’s secession from the EU, although it does reiterate opposition to federalism within the Union. The True Finns demand the expulsion from the EMU of those nations not adhering to its membership criteria. The True Finns oppose any further help to Greece and revaluations of the loan and finally the party opposes possible Turkish EU membership. Certain groups (ethnic, gay, Roma) should wear clear signs on their clothes that separates them from the general Finnish population. That tanks and a dictatorship is the only solution for the Greek problem. That women are destine to satisfy men and breed. That certain African ethnicity should not be allowed to meetings in municipality building because they …dirty them. Between 2011 and 2015 they have polish their rhetoric with only one aim to cheat naïve voters and create a veil to hide their true agenda. Now they call themselves Eursceptics, they say that immigrants are welcome and they even changed their name to the foreign media from the True Finns to The Finns ridiculing any logic and believing that this will change who they really are. Plus they actually believe that because they said it we have to …obey. Their name in Finnish is Perussuomalaiset which in English translates into the most racist and prejudice: The True/Pure Finns. On Sunday 19th 2015 the Finnish people gave to this party 523,045 votes and 38 seats making them modulator of the Finnish Democracy. The winner, Centre Party, Keskusta, has already declared that a coalition with the True/Pure Finns is possible and the only other alternative is a coalition between all the other parties. Something impossible since Christian Democrats and Centre have already shown The True/Pure Finns rhetoric and preferences. Just replace the Socialists, the Jews or the Trade Unionists with the immigrants, gays, Roma, Socialists, liberals, intellectuals, artists, Jews, Africans, Asians, Arabs, Muslims, Rockers, Unionists, left handed and anything else you like! Good night Finland. The Dark Ages just began! Indeed Thanos, what is particularly disturbing is that in the first Dark Ages (7th and 8th century AD) which occurred in Europe the barbarism was mostly physical, that is to say, the barbarians destroyed anything they did not understand, such as cultural patrimonies; in what appears to be the second Dark Ages of the 21st century the barbarism is one of the intellect and will destroy culture much more effectively. It will be much more nefarious and harmful to civilization as such which is always built on culture, as exemplified in the 20th century by the rise of fanatical ideologies such as Nazism and Communism and rabid nationalism and xenophobia, and will make the first Dark Ages look like a picnic in comparison.